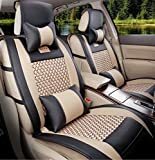 iPerfect seat covers protect your original interior from damage, cover up any existing damage.They’re designed not only to protect your seats in the future years, but also to improve your driving comfort with additional cushioning. Universal fit for all car with 5 seats,Don’t work on the car which conjoined twin seat headrest and back of a chair. Included Full set 10 pieces: headrests*2 waist pillow*2 rear armrest*1 backrest long sear cushion*1 front seat cushion*2 rear backrest*2.